Work is no longer a four letter word once you step into Chippewa Men's 55025 Tough Bark Steel Toe Insulated Boots. The heavy-duty, tough bark leather uppers and abrasion-resistant nylon lining keep your day rolling along with ease. The combination of the rugged and ... (see full details) (see specifications) #CHP55025. Work is no longer a four letter word once you step into Chippewa Men's 55025 Tough Bark Steel Toe Insulated Boots. The heavy-duty, tough bark leather uppers and abrasion-resistant nylon lining keep your day rolling along with ease. The combination of the rugged and durable uppers with the tough lining keep your feet comfortable, and the Chippewa boots are safe from harm, so you can focus on the job you're there to do. 400 grams of 3M Thinsulate Ultra insulation will keep your feet comfy and just the right temperature in the coolest of conditions. The FLEXWELT insoles provide flexible, contoured support for your arches. They're ventilated and breathable, so moisture stays away from your feet when you're wearing these men's boots. The orthotic footbeds also provide maximum comfort and support, and they're removable for cleaning or replacement. Steel shanks and rubber midsoles help support your arches, too. With heavy duty nylon laces and non-tarnishable hooks and eyelets as hardware on the exteriors of the steel toe boots, you'll be covered with long-lasting protection. The Chippewa industrial-quality rubber outsoles of the brown boots are slip-resistant and oil-resistant to protect them against chemical wear. The Goodyear storm Welt stitched construction will guarantee the best workmanship and simple replacement if needed. You'll have steel toe protection that's ASTM-rated to keep you safe from impact, and an electrical hazard rating will ensure you avoid sudden unexpected shocks. Your day will cruise by with protection from incidents when get yourself a pair of Chippewa Men's 55025 Steel Toe Insulated EH Boots. Ease is a four letter word, too, after all. 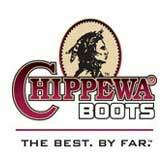 Chippewa Boots: Men's Steel Toe 55025 Brown Insulated EH Work Boots is being added to your cart.